I’ve been a full time user of Vista since the RC’s around September 06. I remained adamant that I was going to use the UAC as much as I could. This week after much pain, the UAC was turned off, and my vista pc’s now seem to be running like a dream. One of the major annoying things seemed to be related to flash plugin’s with IE. One of the worst offenders was www.news.com.au which would crash IE with no explanation constantly. Since UAC has been turned off, not a single crash. Having originally come from the Unix world the idea of effectively doing a ‘sudo‘ in Windows, I feel, is very necessary. Anyone who has had spyware rip through their system would welcome the thought of having to specifically allow a system changing event to occur, rather than it just happening. One problem with UAC appears that as developers most don’t like having restrictions on their PC so turn it off by default. This does make life easier while developing but means that the applications we write are seldom tested correctly. Anyway I’m going to go through a proper post mortem on what actually seems to go wrong with UAC and post here another day. I just wanted to share my “Quick Fix” with you all. 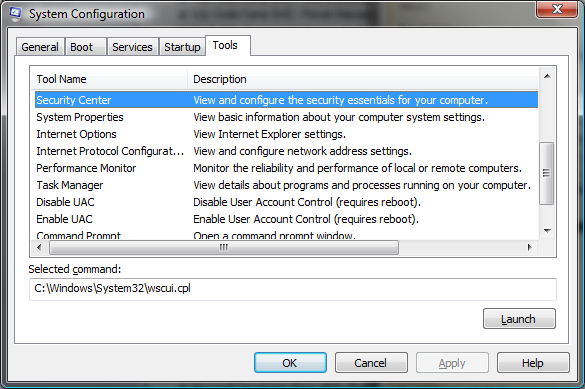 Here’s a quick trick on how to enable & disable UAC. From the run command launch “MSCONFIG”. Scroll down the list and select either the “Disable UAC” or “Enable UAC” depending on whether it’s getting enabled or disabled (see pic below). Click the “Launch” button then when completed reboot, log back on and you should be in business.